Acquired directly from the artist by Harry Torczyner in October 1957. Letter from R. Magritte to A. Iolas, 18 April 1951. P. Waldberg, Ren Magritte, Brussels, 1965, p. 248 (illustrated). H. Torczyner, Magritte: Ideas and Images, New York, 1977, p. 149, no. 291 (illustrated). H. Torczyner, L'ami Magritte: correspondance et souvenirs, Antwerp, 1992, p. 21 (illustrated in color). D. Sylvester, S. Whitfield and M. Raeburn, Ren Magritte, Catalogue Raisonn, London, 1993, vol. III (Oil Paintings, Objects and Bronzes 1949-1967), p. 172, no. 747 (illustrated). New York, Hugo Gallery, Magritte, March-April 1951, no. 23. Lige, Muse d'Art Wallon, Salon quatriennal de Belgique, October-November 1953, no. 157. Antwerp, Stedelijke Feestzall-Meir, Kunst van heden: salon 1956, October 1956, no. 113. New York, Albert Landry Galleries, Ren Magritte in New York Private Collections, October-November 1961, no. 12. Minneapolis, Walker Art Center, The Vision of Ren Magritte, September-October 1962, p. 24, no. 31 (illustrated). London, Arts Council of Great Britain (Tate Gallery), Magritte, February-March 1969, p. 105, no. 73 (illustrated). Montreal, Museum of Fine Arts, Magritte, June-October 1996, p. 186, no. 107 (illustrated in color). Enormous petrified apples re-appear in several other paintings by Magritte. In Les verres fums (lot ??? ), also from 1950, the apple is placed atop a stone pedestal, a galloping granite horse replacing one of its leaves; in two contemporaneous oils entitled Souvenir de voyage (Sylvester, nos. 735 and 736; Collection Farah Alexandra W. Ebrahimi and private collection), it is set first on a rock-strewn plateau, then in a fossilized fruit bowl before a craggy granite wall. 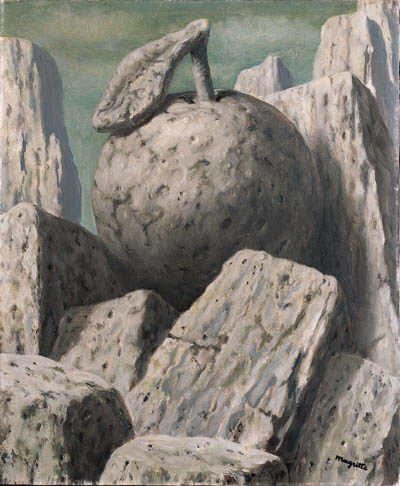 In 1962 and 1963, Magritte executed another series of petrified images; a third version of La parole donne (Sylvester, no. 971; Fondation Veranneman, Kruishoutem) dates from this period, the apple's rocky mount now transformed into a barren lunar landscape.